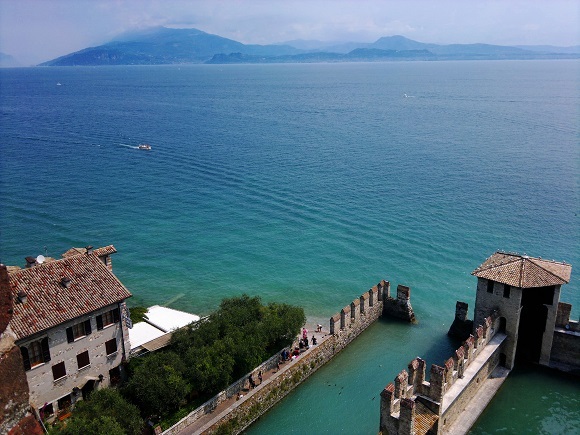 Firstly the location is unique; Sirmione is perched at the end of a long peninsular extending finger like into the southern lake. Arriving by car it reminds me of arriving in Venice yet the town itself seems more like a Ligurian town – houses in every shade of yellow and red, brightly coloured flowers everywhere and little streets that just invite you to explore. Two hotels really stand out and both offer good value and great service. I would rate the Hotel Mavino as the better of the two. The 28 room Hotel Mavino is right in the heart of the old town of Sirmione. Service can’t be faulted and the hotel rooms are well fitted with cable, mini bar, air con etc. Next best choice, with a great pool and better lake views, but a ten minute walk from the old town is the Hotel Suisse (click here to read more). Very impressive and surprisingly beautiful is this14th century castle. The castle dominates the entrance to the town and if you arrive by land then you have to pass through the castle to enter the town. The view from the top is magnificent although the climb up the inside of the tower is quiet steep with lots of narrow stairs and low ceilings too which had my tall husband bumping his head often. You'll have to pay five Euros to enter but the view alone is worth it. The remains of an ancient and massive Roman villa that was once the home of the poet Catullus. A holiday on Lake Garda was all the rage during Roman times and the rich Romans of Verona would often have a holiday home on the lake. Rich in Sulphur these spas have been world renowned for centuries and are as popular as ever. I personally don’t rate them that highly, unless you have bronchial disorders or hearing problems, the treatments of these are their specialty. Sirmione's spas also have a good reputation for helping skin disorders and arthritic conditions. Facilities at both of the spas, Virgilio and Catullo, are very modern and specialists in all the disorders treated are always on hand..
For more on some of the better spas in the Veneto visit our Venice Italy & Veneto Spas Guide. Santa Maria Maggiore's and San Pietro are the two most important churches. I find San Pietro the lovelier of the two. There are some really lovely little stores tucked away in the little lanes of the old town. I always find something to buy - much to the frustration of my husband. Prices are a bit high but you do sometimes get lucky and find a bargain. I tend to find better bargains in September/October once there are fewer tourists around. There's no one store that stands out for me, rather wander around and make your own discoveries. I'm sure you will find a few of those that I photographed for this page: like the ceramics store (there is always something I love there) and that dress shop with all the purple bougainvillea framing the entrance. 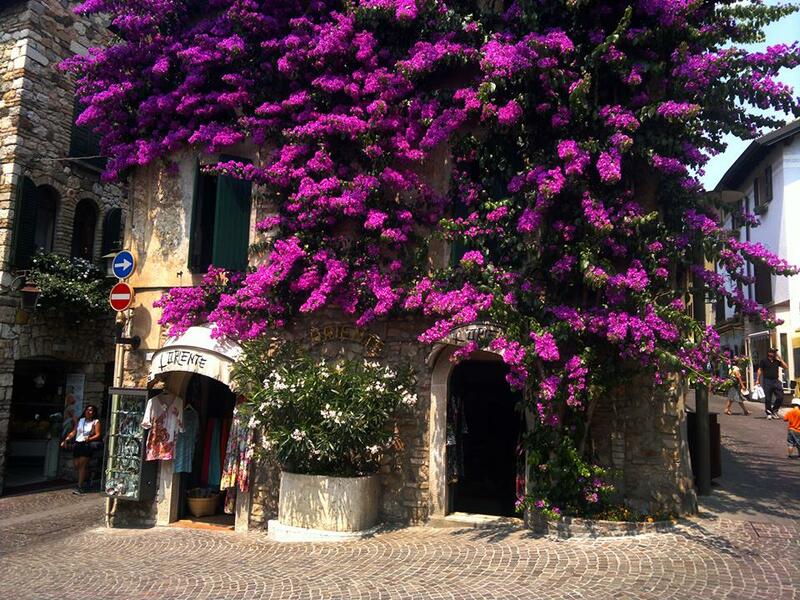 What an absolutely exquisite little jewel Sirmione is. The only pity is that most of northern Italy and the rest of Europe already seem to know that, the result is crowds of people, which tends to spoil the place a little in July and August. Try to visit in September or June if at all possible, if you can’t well do visit anyway. Even with the crowds Sirmione is too good to miss and no holiday on Lake Garda should exclude a visit. Don’t come by car during summer unless your hotel has parking. Parking here is a real nightmare and very expensive too. Our suggestion is to catch the ferry from Desenzano – a far more sensible and pleasant option. 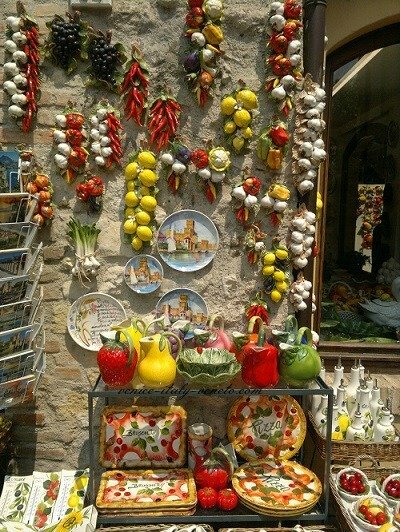 Plenty of overpriced restaurants with horrible food are to be found in Sirmione, many come close to those of Venice when it comes to ripping-off tourists and some are enough to ruin any holiday on Lake Garda. If money is no object then try La Rucola in Via Strentelle. Despite being very expensive the food is excellent. The Risorgimento Restaurant in Piazza Carducci is a more affordable option. For other restaurants around Garda please try our restaurant guide. Discover more great holiday on Lake Garda ideas try our Garda, Venice Italy & Veneto site search engine below.